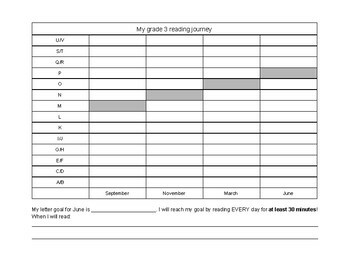 This is an amazing tool to show the student where they are in their reading goals, It helps them to make a SMART goal for the next term and celebrate their progress! My students were so excited to not only reach their goals but watch the upwards trend of their own learning. They could compare themselves to the grade 3 reading level, and to their last term reading level. They became an active protagonist in their own learning. This helped with graphing, goal setting and with motivation to read.